These, along with most of Maplin's other audio kits, has now unfortunately been discontinued as part of Maplin's apparent move away from hobby electronics and into gadgetry. This circuit has, in one form or other, followed me though my DIY audio career. My first ever audio project back in 1990 or so was to build a pair of these in a 2U rack-mount steel case. This was put away, however, once I discovered that my Croft valve power amp sounded far more satisfying, despite only half the power specification. Their final glory is a reincarnation of the original project in the rack-mount enclosure and on the original PCBs, but with a large power supply using a pair of surplus 500VA toroidal transformers and ten 1000uF capacitors in parallel for each power rail, as well as several component upgrades. This remains as a spare power amp, standing in for each of my Stochino amps as these in turn are stripped for replacement of their mains transformers and uprating of output MOSFETs and heatsinks. Its specifications are pretty average, with unremarkable figures for THD and slew rate, but it seems a sensible and reliable design for an active system, for example. 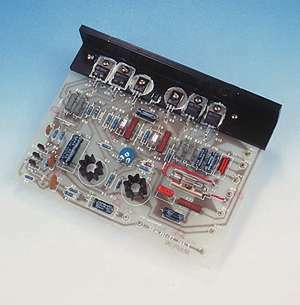 Here is a page on building the Maplin amplifier.